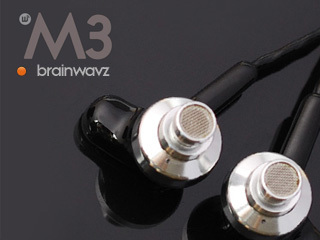 After the successful introduction of M1 and M2, a new flagship is coming from Brainwavz, named the M3. For those of you who keep track of M1 and M2, you might know that these are rebranded products made by the Chinese IEM maker ViSang - The M3 is no exception, besides the fact that it is originally a collector edition available in limited quantity and meant for China market only. This time Brainwavz is able to bring it out of China on a cheaper price by cutting off the excess goodies that comes with the original models. Don't worry though, Brainwavz is still going to include all the standard accessories like that of M1 and M2. MSRP will be US$89.50 with a pre-order price of US$79.50. The original collector edition was sold for close to US$100 in China.